...and Craft Victoria was full of so many beautiful ceramic pieces I kind of just spun around in circles not knowing what to pick up first. 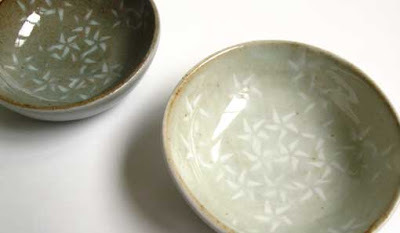 I finally settled on four of these beautiful bowls (below)by South Australian ceramicist Charmian Header, and I have eaten almost every meal out of them since I got home. They are so warm, and just a little wonky. I particularly love the white one, the subtle difference between the white slip pattern and the white glaze, the way it breaks to brown around the rim...Gee, those South Australians really know how to make nice pots! 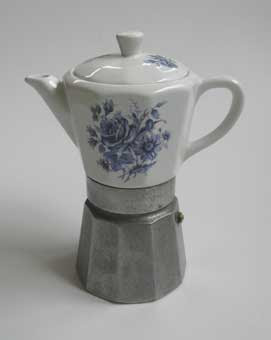 love love love that coffee pot! next time Vipoo! I promise! We need to find you a residency down south, Mel. the chapel st bazaar is my favourite shop ever. Even though I'm not the marrying kind, I swear it's where I'd have my bridal registery!